Having been here for almost seven years, I've concluded that there are as many SketchUp workflows as there are SketchUp users. Trying to recommend a single catch-all combination of tools and methods is like stapling Jell-O to a piece of paper — difficult, messy and ill-advised. When tools like DoubleCAD XT (and DoubleCAD XT Pro) from IMSI/Design come along, things get a little easier to explain. Most SketchUp modelers who design things for a living spend their time somewhere between the second and third dimensions. Models are 3D, but construction (or fabrication) requires 2D documents. Often, those 2D drawings are too complex to use LayOut in SketchUp Pro to make; LayOut isn't a dedicated drafting tool, after all. If you're a Windows user who routinely creates 2D documents, you owe it to yourself to give DoubleCAD a whirl. The no-cost version (did I forget to mention that DoubleCAD XT is free?) is extremely capable, and the Pro version adds lots, lots more for US$695. And if you're a Mac user? I have found issues with Dassault DraftSight on Windows 7. The drawings dissapear entirelly from sight when performing chamfer or cuts. Paradoxically I experienced the same with ProgeCAD in XP, whic hints that they use the same engine. ANyway, I switched to AXCAD wich perfors stable enough. 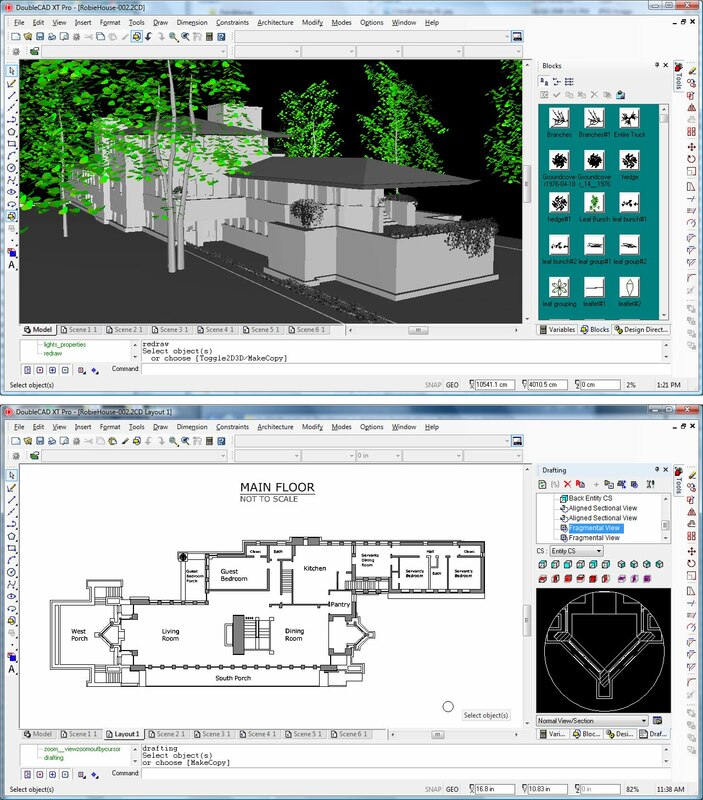 Drawback is taht it cannot handle dwgs saves in AutoCAD beyond 2007 version. I will try DoubleCAD to see what does it do. What about Mac?? OS 10.6. Some of us prefer working on a more stable system! I have downloaded the Doublecadxt v.3. It works fine with sketchup, it's a great help, but something needs to be done about the bugs. It crashes frequently with the message"unhandled exception,the program needs to close". It is quite irritating and bothersome.